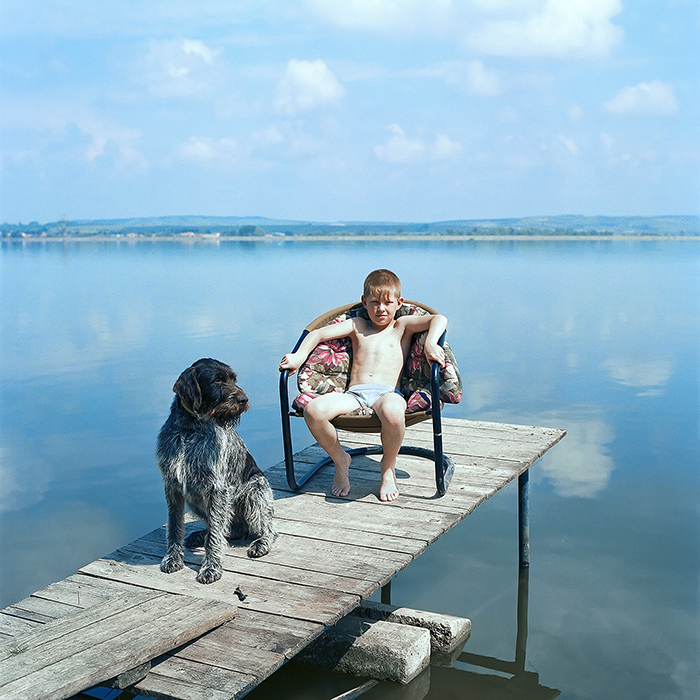 Evzen Sobek (b 1967, Czechoslovakia) is a photographer and educator who lives and works in Brno. He shows internationally and his work is included in museum colletions such as the Museum of Fine Arts, Houston; the Museum of Decorative Arts, Prague; Kiyosato Museum of Photographic Arts, Kiyosato, Japan; and the Collection of the Union of Czech Photographers, Prague. 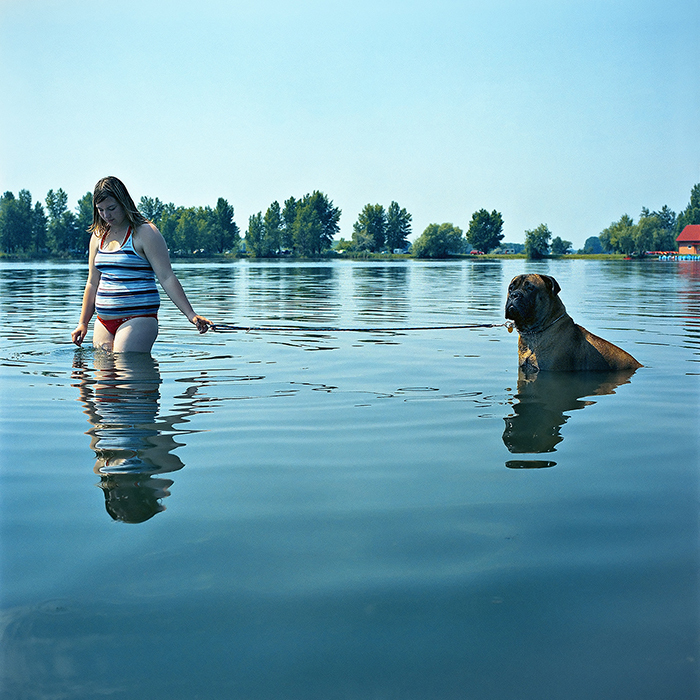 This interview focuses on his book Life in Blue, published in 2011 by Kehrer Verlag. fototazo: How does your upbringing in Communist Czechoslovakia affect your photographic vision in terms of personal experience, visual input, and life outlook? Evzen Sobek: Actually I can say I am quite "lucky" I experienced the communist regime - it was an importatnt experience which gives me a unique opportunity to see and judge life from much wider perspectives. In the 1980s during my studies at the university, I was seriously thinking about leaving the country, but after the fall of Berlin wall there was actually no reason why anymore. Besides it was also much more exciting to stay in Central Europe and observe how the life was changing all around...I don't think that that period has affected my visual input - it has much more to do with literature, music, or simply my way of seeing things. 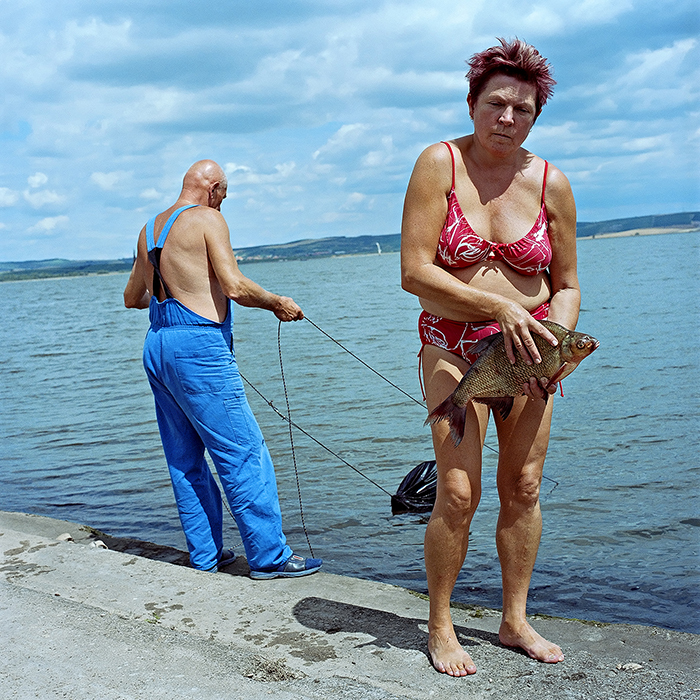 f: In Life in Blue you document the caravanning vacation life around a reservoir created to prevent flooding in the Czech Republic. It seems you could have also focused on the second part of this sentence – the manipulated landscape and the project of combating floods. What is it about the people and the social environment instead that draws you in as a subject? ES: I still think the manipulated landscape is present in the project - in the pictures you can still see something is "wrong" or "strange" or "mysterious. "And that was actually the reason why I started the project - I simply didn't understand why all those people for decades spend their weekends and holidays in such empty space...What attracts them? 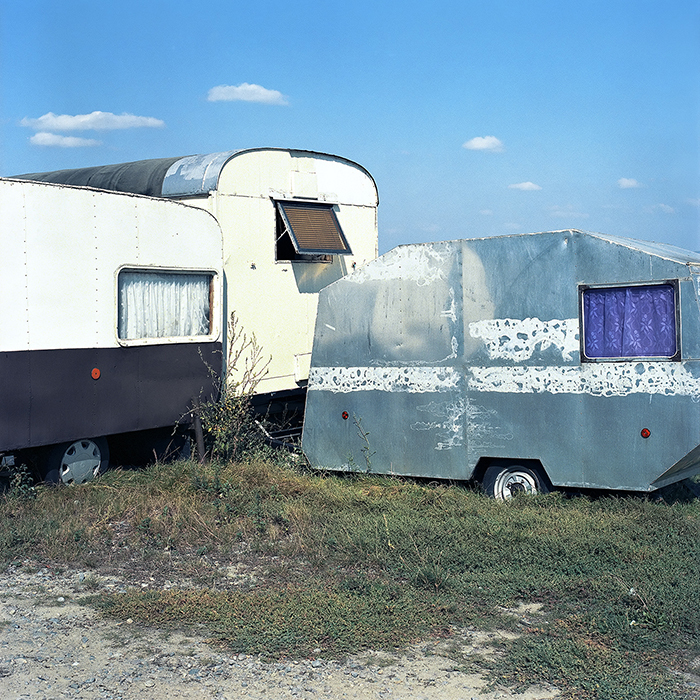 What is it like to spend such long time on several square meters in front of the caravan? f: How did the project Life in Blue start? ES: These lakes are located quite close to Brno, but I never paid any attention to them. And when I got there just by accident in 2006 I was surprised what a lively and strange place it was. As I mentioned before I started to ask all those questions why? And of course I wanted to know answers. The answers I found I chaneled into my photographs. 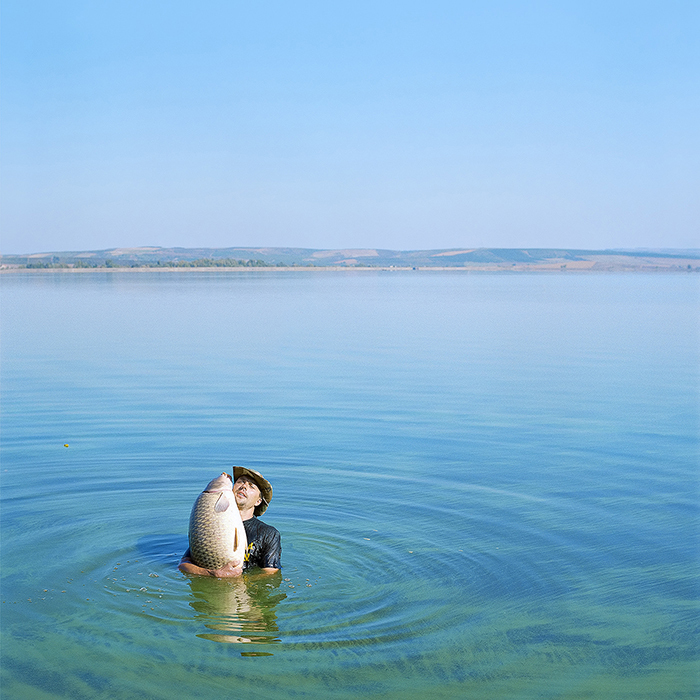 f: How does humor function in the photographs and in the series? ES: I actually never asked myself such question. I am simply impressed by some moments, activities, human swarming and vitality. I would say I simply like observing the world... and photography gives me the chance to share these impressions - this "theatre of life" - with others. Maybe you should ask this question to some sociologists or psychologists! f: Tell us about the relationship that you build with your subjects and how you create images with them. For example, do you spend much time with the people you photograph? Do your subjects collaborate with you on their poses and with the objects with them in the photographs? Are people asked to repeat gestures? f: A related question - how much empathy do you develop towards your subjects when you photograph them? Is it important for you to connect with the people you photograph? ES: Of course at first you need to understand what the situation is about in the area, what is it what attracts people to come to that strange spot again and again... Therefore I used to ask the people how they developed their relationship to that place or why they simply put the trailer on the bank and sit in front of it for years. It definitely helped me to understand the story of the place and made the Life in Blue photos possible. On the other hand you also must keep the needed distance from them, otherwise everything would seem to be absolutely natural and ordinary and you wouldn't be able to see the photographs anymore. So you constantly balance these two points of view. f: This is a straight but hard question I’ve asked a number of other people - what makes a good portrait? ES: Well, I am not specialized in portraits...maybe I would answer more generally: good photographs shouldn't say everything, good photographs should suggest. 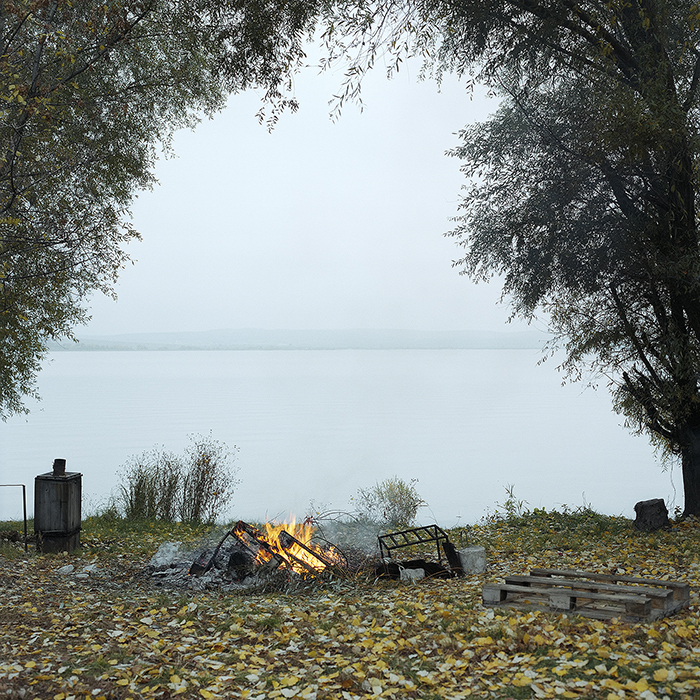 f: Many of your landscapes in the series seem to have a different mood than the portraits. 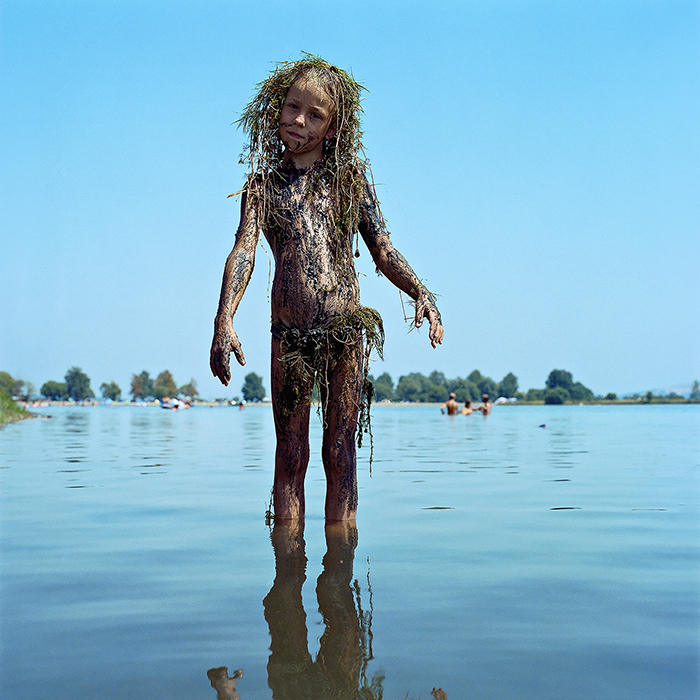 The landscapes – such as with the two swans or the line in the water cutting through the green algae - seem more melancholic, a blue note while at least some of the portraits seem strange and lighter in mood. Do you think there’s a difference as I’m attempting to describe? If you do, how do they relate to each other in the project? ES: I wanted to bring wider range of moods or even contrasts into the story - and actually it is the landscape which brought all the people there. Last but not least, even the people I met at the lakes were not always in the mood for having fun and were more quiet, focused on themselves, solving their own problems. So the landscape photographs can naturally substitute for these states of mind and soul and with their imprints of human activities, they refer to the people. f: Jiri Siostrzonek writes in a post on your work on LensCulture that your images evoke the minimalism of the New Topographics work. How do you see your own work in relation to that work – has it been an inspiration for you? What other photographers or movements have informed your work? ES: I wouldn't say I am significantly influenced by New Topographics work. I am not even able to say a single name of a most favourite photographer. I like many works and photographers across genres. f: In your various projects you have moved from working with a clearly defined theme and concrete setting to working with loose motifs and theme collections. Talk with us about this movement, perhaps how its developed, why you think you move between these modes of working? And how it has been received by the gallery and publishing worlds that perhaps tend to like to package people’s work as a singular style? ES: Moving from one topic or genre to another happens quite naturally as my project comes - and I like to make them various - exploring new territories. Some projects I shoot on classical negative film some on digital camera using apparent software proccesing. The project Life in Blue is taken with a Hasselblad on classic film - it gives me the freedom of movement (no charging, no computer, better weather resistance...) and also people react much more friendly to this kind of camera (compared to an SLR digital). On the other hand, Hidden Landscapes is a series based on using digital technology which enables me to shift the reality in the direction I want. Regarding the galleries and publishers: I don't think publishers distinguish between styles or digital and classic technology. They simply want your pictures for certain purposes with appropriate quality. With galleries and collectors it's a different story - some of them might prefer classical processes, others digital, the next doesn't care at all. But basically, if there is an interest in your work, you can always find a way to cooperate, I guess. f: So many people are looking to get their work published as a book - what were the steps you went through in getting Life in Blue successfully published with Kehrer? What would you recommend to other photographers about the publishing process having gone through it? ES: In 2008 the Life in Blue project was in an intermediate stage so I presented the portfolio and the catalogue (which was quite a unique graphic design and was quite essential for viewing the project) to several publishers at FotoFest in Houston. The best response came from Alexa Becker - new acquisition manager from Kehrer Verlag. We agreed that we would stay in touch and that I would present her the final version of the project. So we met again in 2010 after I had finished the final editing and the book was published in April 2011, just before the show at the Blue Sky gallery in Portland. So even if the book came out in the American market in April 2012, the world premiere already happend in Portland, Oregon in April 2011! The cooperation with Kehrer was pretty great - friendly and smooth - so I believe I will publish the next book with them. My publishing recommendation? Well: good story, edit strictly, prepare a dummy, have your work published in magazines, exhibitions, apply for publication awards. It is extremely difficult to publish unknown work. This post has been sponsored by Metroprint, one of the UK's leading photography printers, specialising in C-type print, large prints, Giclee prints and black and white printing. For information on post sponorships and how they benefit our microgrant program, please click here.